Over the next few hours a herd of Diet members will march through the confines of Yasukuni Shrine, participating in an annual political and personal rite. The march will offend many inside Japan and many outside of it. The governments of China and South Korea will offer critical comment. One focus of attention attention today will be on the number of Diet members who show up (we should expect an uptick from last year's numbers as newly elected members of the House of Councillors make their debuts). Another will be a will she/won't she as regards newly-elected governor of Tokyo Koike Yuriko, whose heretofore staunch nationalist posture now clashes with her task of leading a cosmopolitan metropole. The greatest emphasis, however, will be on visitations by members of the Cabinet. One, Minister of Reconstruction Imamura Masahiro, already paid his visit to the shrine on Thursday the 11th. Minister of Internal Affairs and Communications Takaichi Sanae has vowed to pay a visit today. Minister of Defense Inada Tomomi, who leads a special group within the LDP dedicated to visiting Yasukuni, was suddenly dispatched a study tour of SDF operations in Djibouti. Her gleeful departure from the airport on Friday left little doubt that the purpose of of her trip was the government's trying to keep her away from the shrine on the end-of-war day. In light of Minister Inada's bubbly egress from Japan it is not inappropriate to revisit a point I have made previously about the August 15 Yasukuni sampai. For some of the 210,000 or so who visit the shrine on a typical August 15, a visit on the end of war day is an act of REVERENCE, a time to reflect upon and pay tribute to the sacrifices of those died in service to the nation. For many, including those who arrive in various kinds of dress up – black suits and ties, phony military uniforms or Hawaiian shirts (a favorite of gangster bosses) – the visit to Yasukuni on August 15 is an opportunity to TRANSGRESS, to engage in an activity notable only for being in very bad taste. It is the same delicious sense of being stupid and bad in public, of violating the rules of good society along with one's equally transgressive peers, which is the foundation of the current political support for Donald Trump or the hero worship of Vladimir Putin. The qualitative difference between the two can be summed up by the difference, in English, between patriotism and nationalism. Patriotism is (and for this definition, I am indebted to my TUJ Summer Semester student T. S.) when one loves one's country enough to die for it. Nationalism is (and for this definition, I am indebted to my TUJ Summer Semester student L. K.) is when one loves one country so much one one hates others for it. For too many showing up today at Yasukuni today it will be nationalism, not patriotism, which propels them through the torii. Dr. Noah Smith has been one of the great defenders of Abenomics, that amorphous mass of Keynesian stimulus, Friedmanesque monetary policy and Nice Words About Structural Reform, particularly changes in work-life balance allowing women greater access to executive and management positions. Dr. Smith, however, seems to have undergone a change of heart about the economics of the prime minister. Either that or he has a particular onus against one particular recent seemingly huge announcement: a 28 trillion yen stimulus package, the details of which will be examined in the Diet this Fall (the overal plan received Cabinet approval this week). Japanese growth is still sluggish. Consumers aren't consuming much, and businesses aren't investing. The government doesn't have many options to remedy this, and the Bank of Japan, which has sent both long-term and short-term interest rates into negative territory, has basically no more room to maneuver. The dreaded Zero Lower Bound is starting to bite. The BOJ is buying more stocks, but this too has its limits -- eventually companies become de facto nationalized, as the government becomes the majority shareholder. That's scary both because it would affect corporate governance, and because it would be politically unpopular. It's also unclear how much of an economic boost the stock-purchasing program has given the country anyway. The BOJ could resort to policies like a higher inflation target or the much-discussed "helicopter money" approach, but so far it has been afraid to take these steps. With the BOJ seemingly out of the game, demand-side macroeconomic policy is up to the parliament. So this week the government of Prime Minister Shinzo Abe proposed a new fiscal stimulus package. It is moderately sized: about $45 billion in U.S. dollars this year, and about $60 billion in low-interest loans, to be followed by slightly less next year. Later today (inshallah) Langley Esquire will be posting to YouTube a conversation Timothy Langley and I had yesterday on exactly the same subject. What should be setting everyone's teeth on edge about both the stimulus package and Abe's recent Cabinet picks, aside from the knowledge that both are in-your-face I-got-mine-suckers giveaways to cronies, is that with majorities in both houses of the Diet, a prostrate opposition, an emasculated bureaucracy, a totally compromised bond market, increasingly compromised equities markets and no rival power centers within the ruling Liberal Democratic Party, the Abe government has failed to pass a single fundamental structural reform of consequence. No other G7 or OECD leader enjoys the freedom and dominance of Abe Shinzo and his LDP. Abe & Friends nevertheless remain timid and/or clueless. Amaterasu Omikami, save this blessed land from these poseurs and legacy turkeys. For the first three years of his second premiership, Abe Shinzo surprised many with his restraint and balance. His Cabinets, with a few exceptions, displayed with a mixture of scandal-free operations, diligent policy implementation and submersion of factional and personal rivalries. A deft hand at personnel and calendar management was evident. Which is what is making the runup to today's announcement of a new Cabinet lineup such a downer. There are too many returnees, too many members of the Seiwakai (Mr. Abe's own faction), too many non-experts being placed as window dressing in posts requiring expertise and too few unfledged MPs getting their first shot at leading a ministry. Most of the first timers will be doubly hobbled because they will not even have a ministry behind them. Instead they will be state ministers shepherded around by the Cabinet Office. Staying in place are Suga Yoshihide at Chief Cabinet Secretary, Takaichi Sanae at General Affairs, Aso Taro at Finance, Kishida Fumio at Foreign Affairs, Shiozaki Yasuhisa at Health/Pensions/Labor and the Komeito's Ishii Keichi at Infrastructure & Tourism. Suga Yoshihide is the heart and soul of the Abe administration. Lacking the prerequisites for leadership of the modern LDP and without a thirst for the premiership, he returns to 1) being charge of the bureaucracy, including the recruitment and advancement of the top 600 bureaucrats, 2) being in charge of the Cabinet's work flow and 3) being the chief government spokesman. Takaichi and Shiozaki are Abe loyalists. 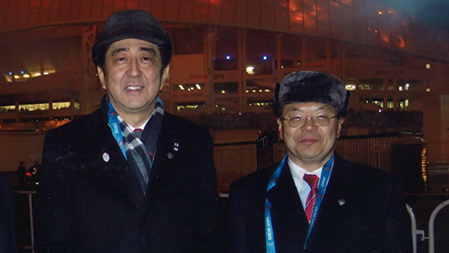 Both served Abe as cabinet ministers in his first term (2006-07). Aso is something an Abe frenemy. He needs to be kept close even though 1) he cannot fundamentally be trusted and 2) his tongue repeatedly creates controversy. Entering the Cabinet are Inada Tomomi and Seko Hiroshige. Both are more than mere Abe loyalists: they are sycophants. Seko indeed has played Mini-Me to Abe these past three years (Link), traveling with him around the world, making a particular spectacle of himself in dealings with Vladimir Putin. Both are largely amateurs in the policy areas they will be managing. The inclusion of Inada and Seko in the Cabinet, combined with the retention of Takaichi and the rumored slide of Abe personal retainer Furuya Kenji into the vacant party post of elections chairman sends a distrubing message -- that Abe, post-House of Councillors 2016, is not in a mood to share with other factions and forces within the LDP. Closeness or service to the party president will be rewarded; all others will just have to lump it. Loyalty is of course important for rulers. However, so are knowledge and perspective - neither of which sycophants and/or personal debtors can provide. Leadership demands that one restrain oneself, not take all one can, convincing those not in the inner circle that the system has rewards, not just humiliations, for them. Abe's seeming abandonment of magnanimity and restraint has me worried. Abe put together a similar team of loyalist and fellow travelers in 2006, one which the news media dubbed the "Friends of Shinzo" Cabinet. Their calamitous performances individually and as a Cabinet make me worried about their echo today.